The aged root of the Iris (Iris florentine) Pallida is used to produce orris absolute, orris concrete (Beurre d'Iris) and orris resinoid. 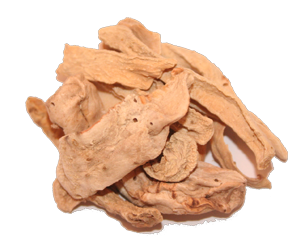 The powdered aged root is used in cosmetic preparations and as a fixative in herbal sachets and pot pourri. Orris absolute is one the most expensive perfumery materials and is rarely found in todays perfumes. The absolute is extracted by solvent washing the orris butter from which the resulting liquid absolute is carefully vacuum distilled. Orris absolute is described as a very pale yellow oil with a delicate floral smell. Orris concrete is produced by steam distillation of the prepared orris root which have been aged 3 years. Because it is steam distilled it is not technically a concrete, rather it is so called because of its solid consistency. Orris butter is produced in France, Italy and Morocco. The smell of aged orris is warm, sweet and violet like due to the high percentage of alpha-irones it contains. Orris resin, which is extracted from the aged root using a solvent like ethyl alcohol, is technically a true concrete. It is called a resin due to it honey like consistency. The 'resin' is cheaper than the steam distilled butter. Sources: Steffen Arctander's Perfume and Flavor materials of natural origin.